If you love boats and water activities, then we have lots in common. There is much we can share and much we can learn from one another. Much we can do together. Even build your new boat, if you want to. anything else related to boats and the sea. By itself, each one of these is a huge subject requiring specific experiences and an immense effort to reasonably cover it. Yet, no work is hard when you love what you do. 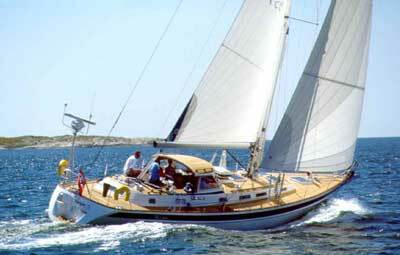 With a keen interest, with lots of love and respect for boats and the sea, we have put together this site. As you will find out, we have covered some good ground. Yet all this is only the beginning. Our knowledge and experiences are but a tiny fraction of what we know together. If you are interested in boats, boating, boat designs, boatbuilding and/or anything to do with boats, if you see that having a quality community website can benefit you as well as other people, you are welcome to actively take part in all activities around this youBoat.net site as you wish. Participate in discussion forums. Contribute to the site content and help at its helm steering it to always be an interesting, rich in high quality content and reliable reference. All for your own benefit and for the benefit of all boaties out there. youBoat.net has been set as your site. You can not only review its pages, search for answers and solutions, discuss various topics and share your experiences in the forums, you can also add your own texts, graphics and whole new pages (under your name/details, if you wish). As a contributor, you become also a part-owner of this site. Add to it, help shaping it and improve its content, reliability and usefulness, and help at the helm. Sailing the horizons of the Internet, thinking of boats, boating, DIY boatbuilding, and the blue seas, this website is where we get together, where we share experiences and learn from one another. Boaties for boaties. You are welcome to share your views, knowledge and experiences, participate in the forums, ask questions and search for solutions, initiate discussions and/or participate in them, form your interest groups and initiate/drive new projects, add new content and improve the existing one, and help at the helm. youBoat.net is a free user-driven environment. The site relies on people just like you. And even if you know nothing about websites and how to display things on the Internet, let that not prevent you from saying what you want to say. Contact us, we'll help with those tiny tech details. Together we know more. Together we can do more and do it better. Let everyone get something good out of it. Of course, you can totally ignore all the above and just browse through the site as you please, if that is all you want to do. Browse through, search for solutions and experiences, get your answers. We are hard on course to give this site quality content and value. If you like your visit, and you get something out of it, next time you think of boats and boating you may wish to come back again. In our experience, having and using a boat of any description is one of the very best ways to always have something interesting to do, to be close with the nature, to engage your friends or to enjoy selected good company, to recharge your batteries and to keep physically and mentally in top shape. And, building your own boat is one of the most unique and highly rewarding experiences. The fun and the rewards start the moment you start looking for the design that you like. You learn so much in the process - that alone is priceless. And, once your boatbuilding project is finished, it gives you a great confidence to know every single detail of your own boat. So, if you are contemplating building your boat in your garage or your backyard, you will find valuable related experiences here. And, when you share with this enthusiastic boating community your own thoughts and experiences on anything related to boats, you will find it very rewarding as we interactively learn from each other. There are no boats too small, no uninteresting or silly questions, and no unimportant problems. Your communications will always be treated with good will and friendship. Together we know more. Together we can do more, and do it better. There is always someone out there who has had that particular experience already, who had been through the same kind of problems you might be going through right now, someone who might save you a lot of time, money and energy with the right advice. Search through the youBoat.net forums. Look for solutions. Post your comments, experiences or/and questions. It is always great hearing from you. This site has been started from a life-long interest, love, admiration and respect for the sea and all creatures living in and around it, love and interest in boats of all kinds, and a dream to sail to all those beautiful places that we all carry deep inside (the dream is still alive!). At the beginning, there were two successful and contrastingly different, both highly rewarding DIY boatbuilding experiences, both described on the pages of this site in detail, starting from the selection of the design, sourcing and purchasing materials, organization of the workshop in the space-constricted home garage, selection of the tools, through all the building steps till the boat was finally launched. It is all here. If you ever considered building a boat yourself, you will get much out of it. 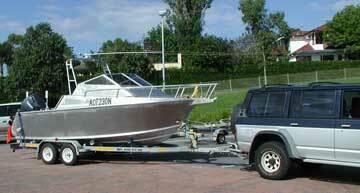 The Platypus, 6.20 m LOA, 2.35 m beam, aluminum-plate mini-cruiser, with a 100 HP outboard. The first project was in building a 6.2 m LOA (length-over-all, total length) aluminum-plate half-cabin trailable mini-cruiser in our home garage (see the picture to the right). The boat was quickly named Platypus, in reflection of its substantial bowsprit, perfect for carrying a 7.5 kg Bruce anchor. The project was initiated and seen through by two enthusiasts with absolutely no previous boatbuilding experience, both computer professionals with no formal trade qualifications. It took more years than we wanted (there were just too many too long breaks in our work), yet resulted in a great and very capable little boat that keeps turning heads wherever it goes. You will find details of both projects within the site. Questions can best be discussed and answered in the forums. You can also contact us directly. The second project came from a need and a desire for more raw physical exercise. The comfort of the Platypus with a rather reasonable 100 HP Yamaha outboard (the hull is rated for up to 150 HP engine, but we bought ours when that was still Yamaha's top-of-the-line four stroke engine) reduced all physical demands to the skills and agility required at launching it from its trailer at the boat ramp, picking it up, and occasional jump into the sea for a swim; the rest was just turning the steering wheel, clicking the electrical switches and bouncing on the waves at some 30 kn speed). When you want some more demanding physical activity, a more radical change from the inactive urban life, then you might be looking for a different kind of boat. After a careful design selection, the second project focused on building a fast 5.2 m (17') sea-going wood-strip kayak (see picture). It is the ultimate physical exercise machine, behaves great on waves, can carry substantial load when used as a touring kayak, and offers the unique pleasure of investigating every secluded shallow, sliding silently through the still waters, blending with the nature and efficiently recharging your inner batteries. The K520, 5.20 m wood-strip fast sea-going and touring kayak. And if you think paddling a kayak like this is an exercise limited to the arms and shoulders, you would quickly change your mind once wedged into its cockpit, your feet pressing against the support plates and your knees supported by the carefully positioned knee-braces. You wear your kayak as an almost natural extension of yourself. Your torso is exactly where all the forces combine, and every stroke of the paddle puts yet another full cycle of work on every muscle of your body. Add to all that a specially designed oversize paddle (see inside for details), and you have in every paddle stroke a complete body workout. The youBoat.net site is dedicated to you and to all those enthusiasts who either have, plan to have or dream to have a water-craft of any sort. Boats of all kinds and anything to do with them and their environment fit here. If you like boats, water and water activities, this site should always be an interesting and informative place to visit, a place where you can discuss things and share your own experiences with like-minded people. If you wish to share your own experiences through the forums, wiki-Documentation or new site pages, but don't know how to go about it, we can help. Just contact us. An effective knowledge and experience sharing environment benefits you and everyone that participates. Together we know more. Together we can do more and do it better. Tell us about your boat and your boating experiences. Even if you don't have your own boat yet, tell us about your interests and plans. Boaties are dreamers. Dreams are free, yet they are a great source of vision, energy, dedication and determination. All achievers are dreamers first. Access to the site and all information within it, including all forums, is free and does not require any registration. For an active role, to start new forum threads, to post questions and to participate in forum discussions, to rate forum threads, boat designs, books, or to add materials to the site, please register and login under a unique nickname by which you will be known within our community. There are no any other requirements.